We will be back here for sure! A cute place made for relaxing! This place is a true gem! Walk to beach, stargaze from inside, view the ocean waves from the porch. It was homey and had everything we could have wanted! Three of us stayed in this quaint house overlooking the ocean on the north end of Cambria. We all were quite impressed with its accommodations and how clean it was. The kitchen had everything you could possibly want in it, including spices! The bathrooms were furnished with fresh towels and had spare soap, shampoo and a hair dryer! Lots of books to choose to read, a deck where we drank our morning coffee and grilled our Christmas meal! The area was close to hiking trails and within walking distance to Main street. We were able to view the wildlife from our back deck and bedroom windows. We had 2 deer that liked to visit us! This was a lovely place to stay and we were pleasantly surprised. This is a wonderful home with a very nice view. The house has a cozy feel and is decorated with art from around the world. There is a decent bed in the master bedroom. The queen in the other bed creaks with the slightest motion.The table only seats two and two can sit at the kitchen island, however the stools provided are too tall to sit comfortably. A table for 4 would be a great addition considering it sleeps 4. Thee things are easy to fix. If it were my home I would do so and then our rating would be higher. Fabulous property and location. 5 min walk to beach. Close to town. Beautiful view. Love the windows. Everything was provided for. Would definitely stay there again. It's a hideaway with a view of the ocean, deck, clean, decorated lovely. Very relaxing. Really enjoyed our stay. 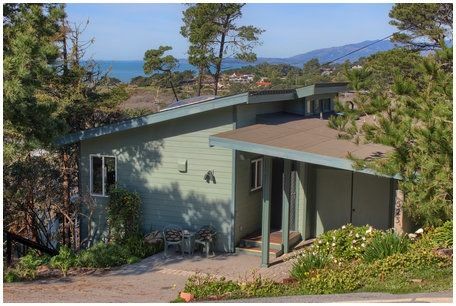 Cambria is a great town and the property description was accurate regarding the location, layout, amenities. We loved lillies and many of the wonderful restaurants in town.